At Federal Records Management & Shredding we are constantly monitoring and adapting our services to give our customers the best and most convenient information management and document destruction services possible. We want our customers to be confident knowing their records and information have been kept secure the entire time they have been in our possession. This is why we have now equipped all of our trucks with the latest GPS tracking technology. We have always used secure, dedicated trucks — driven by our certified employees — to both retrieve records for destruction at our facility and to deliver documents to our customers from our secure storage. The added GPS technology allows us to take this security to the next level. We can easily and reliably monitor the real-time location and route of our vehicles — and YOUR records — at all times. This also provides us with a historical record of the vehicles routes and stops. If needed, we can verify the route of specific document transmissions and confirm the exact timing of pickup and delivery. GPS tracking also allows us to dispatch trucks more efficiently and monitor their progress without having to call the drivers for updates. And that means faster and more convenient service for our customers! Federal Records Management & Shredding is the only records management and shredding company in Fort Wayne that has been AAA-certified by the National Association for Information Destruction. We offer secure on-site or off-site document shredding as well as document management and storage services. 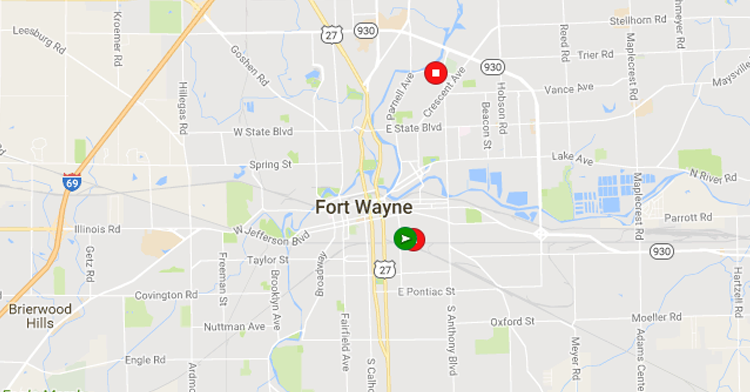 Contact us today at 260.267.9652 to talk with one of our specialists about our new GPS tracking feature and how our services can help your business easily meet all of its needs.